1. Separate 3 eggs into a round bottom bowl. Add the white wine vinegar & orange juice. Whisk together over a pot of simmering water until the mixture becomes opaque in colour & light & fluffy in texture. 1. Place the bugs & salmon in the orange chilli marinade for one hour. 2. Combine all salad ingredients together. 3. Remove the seafood from the marinade & place on a pre heated Char grill or BBQ. Gently pour over some of the remaining marinade to keep the fish moist. Grill for approximately 8 - 10 minutes. 4. Arrange the salad onto 4 plates. 5. Remove the seafood from the grill. Gently break the salmon into mouth size pieces. Remove the bug tails from the shell. Place the seafood onto the 4 plated salads. 6. 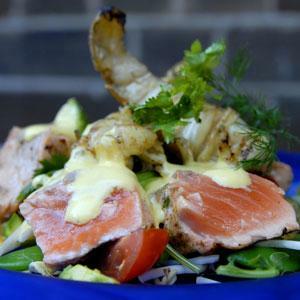 Drizzle with the new style healthy hollandaise & serve! With water chestnut, sesame seeds and mint accentuations.